While Wheels on Meals is building towards the big action finale, it’s also building its characters into people who we grow attached to. By the end, we’ve laughed with them and held our breath as they’ve escaped danger; they are our friends and we care about them. Not in the same way that we might care about characters in a straight drama, but these characters are endearing and are fun to spend time with. Even the film’s cameos from Richard Ng and John Shum (who both starred in Winners and Sinners) are endearing, so when their characters return for a scene later on I was thrilled to spend a little more time with them. And while I’m talking about them I might as well mention Wu Ma’s hilarious turn as a guy who thinks he’s an alarm clock. It’s funny in a weird way that only a Hong Kong movie of the 1980s can pull off. This focus on gradual plotting and endearing characters is what seems to set the Sammo Hung-directed films apart from the Jackie Chan-directed ones. I haven’t seen enough of Sammo’s other movies to know if it’s a general trait of his films or not, but at least in terms of Wheels on Meals and Winners and Sinners (compared to Jackie’s then-most recent films Dragon Lord and Project A), it holds true. I love Project A to death, but without the action I don’t really care one way or the other about the characters. The characters in Wheels on Meals, however, I’d be happy to see them in a straight comedy without any action at all. 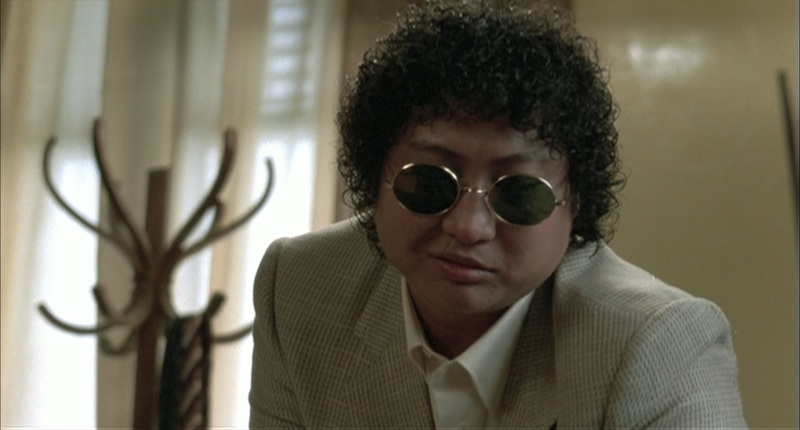 Sammo Hung is also a very underrated director in the grand world of cinema. Obviously, martial arts fans all know and love his work, but a film as expertly paced and edited as Wheels on Meals really should be applauded beyond our cult circles. The editing is especially good throughout the action sequences, with the cuts to slow-motion shots in the midst of the fury standing out the most. The one that everyone remembers, where Jackie blasts Benny The Jet with a punch to the face, is the standout example of this, but there’s a bunch of really smart uses of this through the whole film that punctuate moments that deserve it. Sammo also makes fantastic use of quickly cutting to a reverse shot mid-fight to give us a more visceral place amidst the action. It makes the movement sing, and it helps to create some of the best action ever put to film. Speaking of which: the martial arts in this movie are pretty good, you guys. : ) The end fight between Jackie and Benny the Jet is an absolute genre legend that continues to impress no matter how much water has passed beneath the bridge. It’s simply one of the greatest one-on-one battles ever filmed and it really boggles my mind to think about how this movie is only 12 years after the Shaw Brothers films I’ve seen most recently in my chronological series. Sure, 12 years is a fair amount of time, but the progression exhibited here is like the difference between dreaming of walking on the moon and establishing a colony there. Anyway, choreography-wise Wheels on Meals is one of the genre’s crowning achievements. The movements are all just so fast and clean. Even if the rest of the movie was just OK (and it’s WAY better than just OK), the end fight would elevate the film to legendary status. 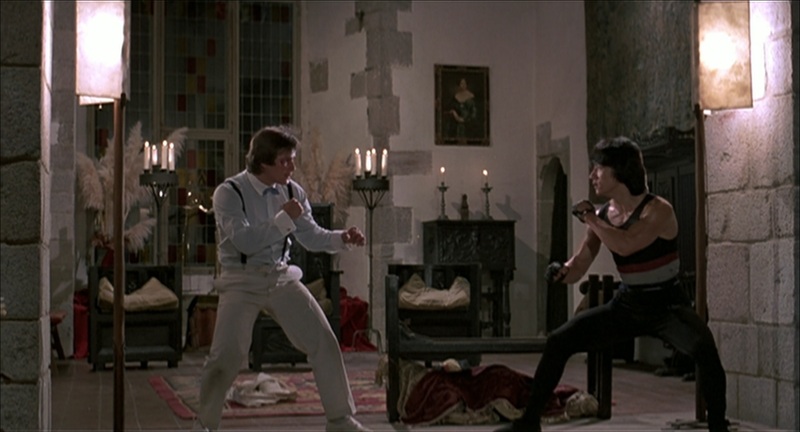 The fact that this incredible battle is also crosscut with Yuen Biao fighting Keith Vitali and Sammo swordfighting Pepe Sancho only makes it all that much more exciting. 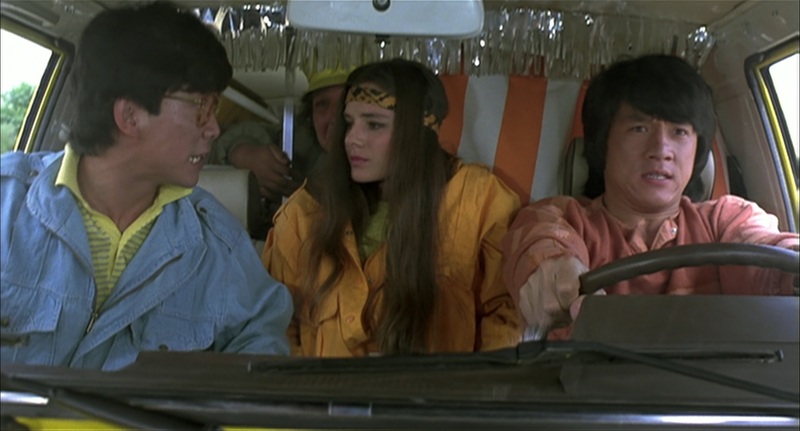 Wheels on Meals is one of my favorite Jackie Chan films, and it’s one that I respect and appreciate more than ever after finally seeing it with adult eyes. Right from the opening moments, the film put me in my happy place and I sat there for the next 108 minutes with a big ol’ smile on my face. It’s funny, it’s charming, and it’s got Sammo’s glorious Chinese Jheri Curl, Yuen Biao’s ridiculous athleticism and Jackie Chan jumpkicking a dude off a motorcycle. You can’t ask for much more than that… and that only scratches the surface of the wonders than Wheels on Meals has to offer. Watch it and thank me later. And check out my buddy Uncle Jasper’s review from a few years back, too! Next up in this chronological journey through the films of Jackie Chan: Sammo Hung’s My Lucky Stars! See ya then! I wish that there was a sequel based on what Sammo’s character said at the end. It would have been a better use of time than Twinkle, Twinkle Lucky Stars.